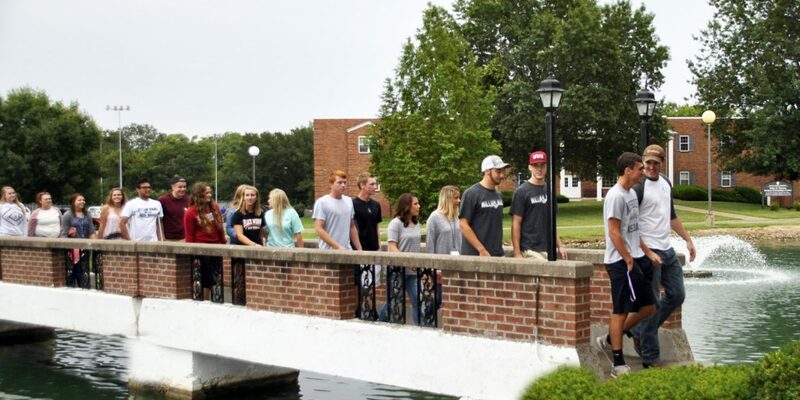 A new activity will be added to traditional events this year during William Woods University’s new student orientation. 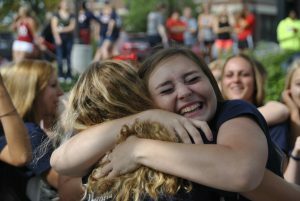 Freshmen and transfer students alike are encouraged to “Find Your Fit” during their first week at The Woods Aug. 18-21. Approximately 280 new students are expected to attend, including 32 who are legacies because a family member attended WWU. Playfair will be held at the Sam B. Cook Amphitheatre at 10 a.m. Saturday, Aug. 20. “We have a full orientation schedule designed to aid new students with the transition into the William Woods community; meet and interact with fellow students, faculty and staff; and learn about campus services and resources available to help them ‘find their fit’ at WWU,” Dittmer said. The week of transition begins at 8 a.m. Thursday, Aug. 18, with residential student check-in at McNutt Campus Center, followed by residence hall move in. Commuter students check in at 10 a.m., also in McNutt Campus Center. 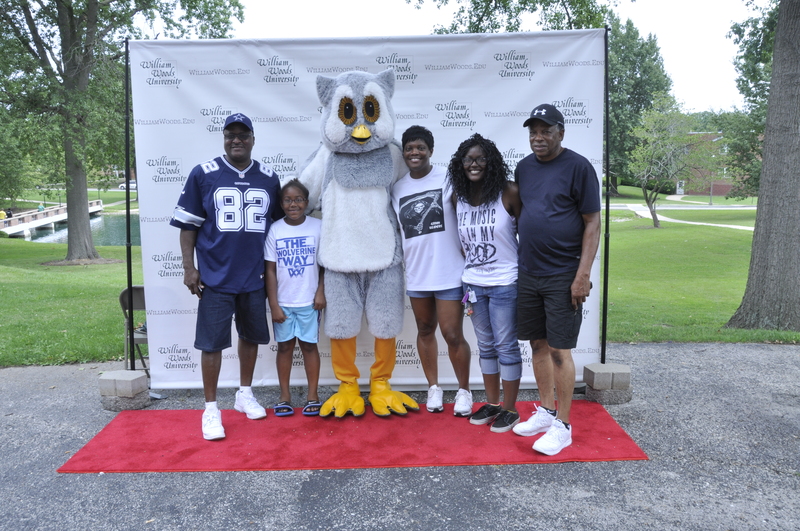 A family poses on the Red Carpet with Screech, the WWU mascot. 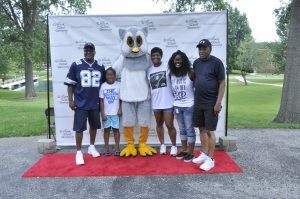 Students can have their photos taken on the red carpet with family, new friends and Screech, the WWU mascot, on the Tucker Dining Hall lawn from 11 a.m. to 12:45 p.m. Pictures will be posted to Facebook. The Office of Alumni Activities hosts a legacy lunch at 11 a.m. for new students and their families whose relatives have attended WWU. An international student lunch will be held at 11:30 in Woody’s, while commuters and non-traditional students will have a meet and greet lunch at 11:30 in the Commuter Lounge. Dr. Jahnae H. Barnett, university president, officially welcomes new students to WWU at 1 p.m. in Cutlip Auditorium of the McNutt Campus Center. Afternoon sessions include sorority and fraternity open houses, orientation group meetings and success in the classroom. Rachel Ostrem, senior class president, leads students across Senior Bridge during the Ivy Ceremony, a long-standing tradition at William Woods University. 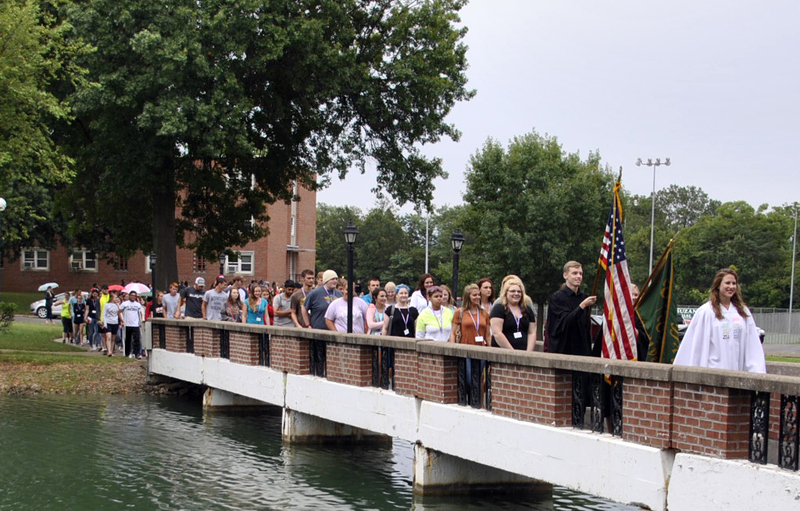 The Ivy Ceremony, the first part of a two-part tradition that culminates at graduation, begins at 5 p.m. at Senior Lake (rain location: McNutt Campus Center). A family and friends farewell barbecue follows on the Tucker Dining Hall Lawn. 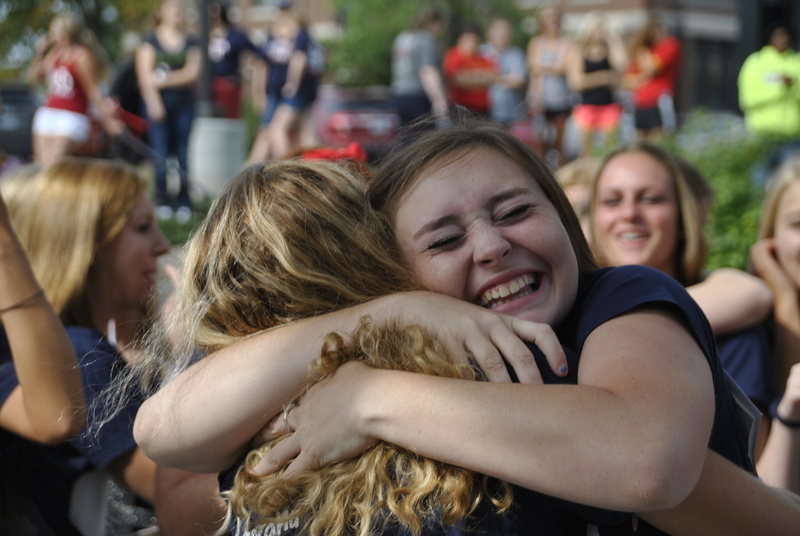 Residence hall meetings at 9 p.m. will be followed by an ice cream social on Smith, Allen, Swearingen lawn. Students will engage in critical thinking and analytical reasoning exercises on Friday, Aug. 19, and become acquainted with other parts of life at The Woods during sessions on money matters, adviser meetings and dessert with Faith, Counseling and Health Services. The afternoon offers the opportunity to bowl with faculty, attend a movie or enjoy some Froyo downtown. Fraternity and sorority events and a movie and game night conclude the day. “Students will interact with faculty inside, as well as outside of the classroom, during critical thinking and academic sessions, followed by bowling with their professors,” Dittmer said. Saturday, Aug. 20, consists of a Connections class, fraternity and sorority events and a fun in the sun activity. That evening, Peer Players present the community standards and campus life play, which discusses issues facing college students and the resources available on campus. After the play, Campus Activities Board will sponsor a Woods Glow—Light it Up activity blending sound and light in the Sam B. Cook Amphitheatre. Sunday, Aug. 21, sorority preference parties will be held in the morning and offices will be open from 1 to 3 p.m. A social on the dock, hosted by Interfraternity Council, and a disc golf tournament are scheduled for the afternoon, followed by sorority bid night at 5 p.m.
A sorority member welcomes a new sister during Bid Day 15. After the first day of classes on Monday, Aug. 22, an orientation red carpet after-party will be held in McNutt Campus Center. At 7 that evening, students will get “the 411 on 911” during an all-campus safety event at 7 p.m. Men’s bid day will be at 9 a.m. Saturday, Aug. 30.